Ian Brown is reportedly working on his first solo album in almost a decade. The Stone Roses frontman's most recent record was 2009's 'My Way', and it's said he wants to release the collection before the end of the year. A source told The Sun newspaper: "It's been nine years since Ian dropped his last solo album so he finally decided it was time to start working on a new one. "He wanted to recreate the lo-fi vibe of his first album 'Unfinished Monkey Business' so has recorded the whole album in analogue. Ian put it together with some close friends in Manchester and a team at Fiction Records is the driving force behind it." The report adds that Ian - who has released six solo records to date - wants to emulate the success of former Oasis rocker Liam Gallagher, whose first album 'As You Were' stormed the UK charts earlier this year. The insider said: "He's hoping to drop some of the tracks in November and filmed the music video for one of the songs last week on a bridge overlooking the Bridgewater canal in Agden. "Ian's really hoping it's going to take off and has been inspired by Liam Gallagher's solo successes recently too." 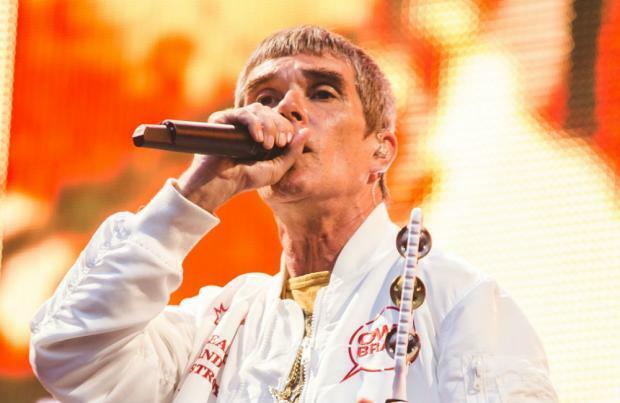 The latest development will continue to fuel speculation Stone Roses have gone their separate ways following a run of UK tour dates last year. At the end of their show at Glasgow's Hampden Park in June 2017, the singer told the crowd: "Don't be sad it's over, be happy that it happened."